Winston County is contained with Mississippi Emergency Management Agency District 4. 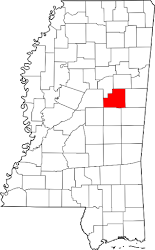 Other counties included in this District are Calhoun, Chickasaw, Choctaw, Clay, Lowndes, Monroe, Noxubee, Oktibbeha, and Webster. MEMA District 4 is in the process of reviewing its Hazard Mitigation Plan. The Hazard Mitigation Plan is a document that is required by FEMA for any county to participate in its grant and disaster reimbursement programs. The Plan incorporates how the local government will respond to any type of natural disaster or man-made emergency. It also serves as the guide that municipal and county governments use to develop preparedness, prevention, and educational programs to address all threats to the communities. WINSTON COUNTY BOARD OF SUPERVISORS This agenda is tentative and subject to change prior to the Board's meeting. To be placed on the agenda for the Winston County Board of Supervisors meetings, please call 662-773-3631 by Wednesday noon the week preceding the Board meeting. Winston County would like to welcome Natron Wood products to our community and thank all those involved in bringing our newest employer to Winston County!